Maybe your budget doesn’t stretch to the penthouse. Maybe you don’t have a head for heights. 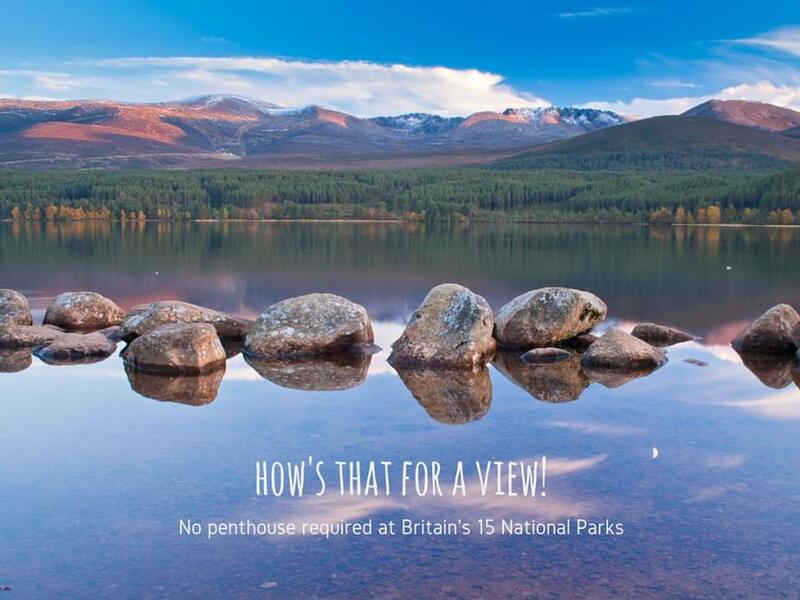 Or maybe you want an uninhibited 360 degree view that only one of Britain’s 15 national parks can provide. It’s time you got yourself to one of the UK’s 15 national parks. And National Parks Week (24-30 July 2018) is designed to achieve that (and to untarnish the memories left by school trips many moons ago that involved uninspiring treks up hill and down dale in all weathers, although largely damp ones if my memory serves me correctly). Walking will never be boring again once you’ve conquered your first mountain or picnicked in a cave or cairn overlooking unhindered natural glory. Put your walking shoes on, the hills are alive with paths, trails and splendiferous vistas. Take your imagination on a history tour through Northumberland along part of the 84 mile-long Roman remains of Hadrian’s Wall while soaking up a view that is largely unchanged for centuries. This peaceful, purple heathered national park is Britain’s quietest and England’s most northern. From the Cheviot Hills to Kielder Water you’ll discover Bronze Age burial sites and Dark Sky Discovery zones. It’s peaceful up here. Somehow, ‘moors’ in the context of our national parks have gathered a somewhat eerie feeling. Yet like Exmoor, the North York Moors national park is a beautiful expanse of rolling countryside tumbling down to the coastline with its pretty fishing villages and popular seaside resorts of Staithes and Robin Hood’s Bay. Perhaps more of a perspective than a view but delightful all the same: take a trip on the North Yorkshire Moors Railway. Don’t take a weekend break in York without a wander out to the wonderfully lush valleys and technically impressive drystone walls of the Yorkshire Dales. If you’re a bit of an adventurer but don’t have time to travel, Yorkshire has three peaks of its own for you to conquer: Ingleborough, Whernside and Pen-y-ghent. You’ll be spoilt for choice of views from up there. And the reward for your efforts? A chunk or two of Yorkshire’s most famous cheese: Wendsleydale. Go on, Gromit will be proud of you. Bit of an accolade hogger, this one. Arguably the coldest and most northerly, the Cairngorms is also Britain’s largest national park. As home to Ben Nevis it is the national park with the highest mountain. And for climbers that view speaks for itself. It also happens to have the largest native forest. All in, you could be forgiven for thinking you’re in New Zealand and you’ll find many a Kiwi tramping this spectacular landscape in search of a slice of home. As and when winter decides to arrive, you can ski here too. And on a clear day stop and look before you push off into a parallel, you won’t be disappointed. This could turn into a blog of one up-manships. Loch Lomond itself is Britain’s largest inland stretch of water, but it’s one of 22 large lochs in the national park. And the undulating landscape that surrounds these lochs includes 21 Munros (that’s a summit of more than 3,000ft). So views aren’t really tough to find here, whether you’re canoeing or cruising, rambling or mountain biking. Just remember to pack your camera. Naturally we wouldn’t advocate opting for any kind of accommodation other than a holiday rental. But if experience demands it, Dartmoor is the only national park that welcomes you to wild camp. This heathery moorland with its rocky outcrops and much loved Dartmoor ponies offers dramatic sunsets, stunning Instagram moments, challenging cycling and probably the most peaceful landscape between Plymouth and Exeter during peak season (it’s under an hour’s drive from both so don’t get all Devon-centric on us). Bored with the view, head to Dartmoor Zoo for a slice of Hollywood – Matt Damon shot a film there (yes, it was about zoos). A little further north and yet more moorland with rolling valleys and rugged coastal cliffs that create Exmoor National Park. The most common local species are the Exmoor ponies but you’ll find plenty a friendly human in the cute villages and their welcoming public houses. You’re a bit spoilt for choice on the view front here, whether it’s quaint cottages or standing stones. But perhaps the best view of all comes on a clear night – this is an International Dark Sky Reserve. Talking of stars, the Brecon Beacons is another International Dark Sky Reserve in the south west. But it also gains worldwide recognition for its geology (that’s unique rock formations to you and me). If you prefer a view that doesn’t have you looking up or digging down, get a shimmy on up Pen Y Fan – it’s the highest peak in the park and boy oh boy you won’t be disappointed. Named after its main draw card, Snowdonia National Park is home to Wales’ highest mountain, Mount Snowdon. But if the train isn’t running, Pyg Track doesn’t take your fancy and mountain biking is off the agenda, there are spectacular waterfalls like Swallow Falls and Aber Falls to name just two. And well preserved castles at Caernarfon and Harlech that a climb to the top of a turret won’t disappoint when comes to the view. Nobody can take away this claim to fame: the Peak District was Britain’s first national park and Derbyshire couldn’t be more proud of it. This varied landscape between Sheffield and Manchester is a park of two peaks. Dark Peak of the north with its heather moorland and hard rock contrasts with the limestone valleys and babbling brooks of White Peak in the south. You can guess where the rock climbers go and imagine the views they are invited to absorb. Large swathes of Norfolk and Suffolk create the wettest of our national parks. This isn’t based on rainfall. The Broads are a protected wetland that’s brimming with wildlife (and some of Britain’s rarest species). Funnily enough, it’s a popular boating spot and we have many Norfolk cottages with moorings and homes in Suffolk with boats you may be able to use upon arrangement. Aside from messing around in boats, it’s mostly flatland. But the coastal views are simply stunning across long stretches of sandy beaches. For views from on high, the ‘Cathedral of the Broads’, St Helen’s Church in Ranworth, will provide an extra special perspective on this historic landscape. Wild horses couldn’t stop me from visiting this national park, but they might slow you down – this is wild horse territory. As one of the largest unenclosed areas of pasture land in England you don’t need to look twice if you see pigs roaming. You can also go riding on tamed horses through the undulating heathland and it’s the perfect way to gain perspective and a decent view or two across the landscape that stretches across Hampshire, Wiltshire and nudging towards Dorset. For a less natural option, the top deck of the New Forest Tour Bus will steer you from countryside to coast for views aplenty. Perhaps of all the national parks in the UK this West Sussex area would be the least known for its national park status. But then it is England’s newest national park. Since 2011 this area of pretty market towns and chalk cliffs is officially worth protecting. The white cliffs of the Seven Sisters near Eastbourne are a stunning site. Slightly less spectacular but no less deserving of a look is the Chanctonbury Ring thought to date back to the Iron Age albeit just a circle of trees on first site now. And for those who fancy watching the sunset from their Arundel cottage or Winchester apartment, you won’t be stuck for sourcing a local vintage – there are English vineyards right before your eyes.